Middlesbrough extended their lead at the top of the Championship with victory following an error from Brentford goalkeeper David Button. The winner came when his punch looped up and towards the line, although it looked like Boro defender Daniel Ayala might have got the final touch. It was harsh on Brentford, who saw Alan Judge and Maxime Colin denied by fine Dimi Konstantopoulos goalkeeping. Button made some fine saves of his own but his error proved costly. Boro climb six points clear of second-placed Derby with a game in hand. The Teessiders began the night four points clear of the Rams and arrived in west London with an unbeaten league record against their opponents stretching back to 1938. However their position was no concern to the home side who attacked Boro with vigour and caused problems through top scorer Judge's creativity throughout. Konstantopoulos foiled Lasse Vibe when he capitalised on an Ayala error, and Button was smart to stop David Nugent from a similar position before the break. Brentford looked to be in the ascendancy after half-time, with Boro again indebted to Konstantopoulos' efforts, but a dangerous corner in a swirling wind proved their undoing as Button's attempted clearance sailed up and towards the goal, and Ayala wheeled away in celebration having claimed to poke in the crucial goal. Bees boss Dean Smith made all his changes in a bid to overturn the deficit but Boro stood firm to pick up the points and edge further clear of their promotion rivals. "I'm disappointed with the result but as I've said before we can only control performances and the performance was very good. "If we continue to look after our performances the results will follow. The performance tonight would have been enough to beat many sides in this division. "Boro are a good team with good players and we more than matched and at times looked marginally better than them." "We have been really lucky because to be fair in the first half Brentford had three chances and we have made two or three mistakes. "Sometimes you pay for those mistakes, but when you are top of table the luck can stay with you. "They are confident on the pitch and that confidence means you can make mistakes, but there are another 10 players who know you and are always there just in case." Match ends, Brentford 0, Middlesbrough 1. Second Half ends, Brentford 0, Middlesbrough 1. Adam Clayton (Middlesbrough) wins a free kick in the defensive half. Corner, Brentford. Conceded by Adam Forshaw. Adam Clayton (Middlesbrough) is shown the yellow card for a bad foul. Corner, Brentford. Conceded by Fernando Amorebieta. Substitution, Middlesbrough. Adam Forshaw replaces Albert Adomah. Attempt missed. Alan Judge (Brentford) left footed shot from the right side of the box is high and wide to the left. Assisted by Marco Djuricin with a headed pass. Cristhian Stuani (Middlesbrough) is shown the yellow card for a bad foul. Foul by Cristhian Stuani (Middlesbrough). Substitution, Brentford. Philipp Hofmann replaces Lasse Vibe. Jake Bidwell (Brentford) wins a free kick in the defensive half. Foul by Marco Djuricin (Brentford). Corner, Middlesbrough. Conceded by Maxime Colin. Cristhian Stuani (Middlesbrough) wins a free kick on the right wing. Attempt saved. Albert Adomah (Middlesbrough) right footed shot from outside the box is saved in the top centre of the goal. Substitution, Brentford. Marco Djuricin replaces John Swift. Attempt missed. Albert Adomah (Middlesbrough) right footed shot from the left side of the box is close, but misses to the left following a corner. Corner, Middlesbrough. Conceded by Toumani Diagouraga. Harlee Dean (Brentford) wins a free kick in the defensive half. Corner, Brentford. 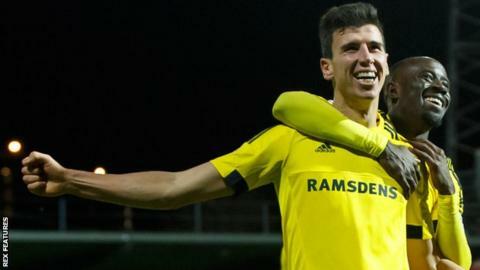 Conceded by Daniel Ayala. John Swift (Brentford) wins a free kick on the left wing. Attempt missed. Toumani Diagouraga (Brentford) right footed shot from outside the box is too high following a set piece situation. Alan Judge (Brentford) wins a free kick on the left wing. Substitution, Brentford. Sergi Canos replaces Sam Saunders.